Herculeze has found just a few reasons why you should give us a try. Herculeze is a local on-demand peer-to-peer marketplace that makes getting large or heavy items picked up and delivered easy. If you have just purchased new furniture, estate sale items, garage sale items, and more we can help. If you have an old couch or table you need to donate, or need to have something taken to another home, we can help. We have listed some reasons why you should give us a try. 1. Herculeze does not pay by the hour, by miles driven, or by weight. Herculeze has hundreds of freelance drivers that can see when you post a job. Once they review the post (object, size, approx. weight, and pick up/drop off locations) the drivers can place a bid of what price they are willing to do the work for. Multiple drivers can bid and you get to choose the bid price you like best and think is fair for the job. It is a set price. There is no additional cost for the time it takes to complete, distance driven, etc. You know what you are paying up front. 2. We offer competitive pricing. 3. You can have the item(s) insured. If you are feeling uneasy about letting others handle your item(s), we offer an option to insure them during the delivery process. Our drivers take care of your items but if anything were to happen, you are covered! We take the stress out of the process. 4. 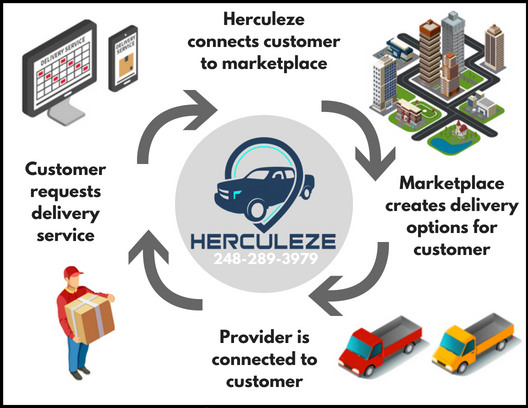 Herculeze is uberizing the delivery process for large or heavy items. Herculeze takes pride in what we do and our goal is to create an on-demand marketplace that is easy to use and helps get one or two large/heavy items picked up and delivered in a timely matter. We are working to completely automate the process to allow for faster response times, ease of use, and to help connect people with a truck & muscle to people who may not be able to transport the items themselves. 5. Herculeze is a local small business. We are proud to be a local small business in the Greater Detroit area and are expanding! We listen to customer & driver feedback and build on it. If there is a problem, we fix it. Herculeze betters itself everyday and wants to make the process as simple to use as possible. With in the next 1-2 years, we want to completely automate the process to increase rate of satisfaction and speed of service as well. Give us a try and test it out for yourself. We have hundreds of drivers able and willing. When you need something brought home, moved out of the home, or transported to any other local location remember Herculeze delivers…Literally.